I play Tetris on a day-to-day basis, and my favorite place to play is from the comfort of home. For me, there’s nothing quite like lounging about in pajamas playing round after round of Tetris online. Home is a Tetris haven thanks, in part, to its familiarity. Another reason is because I always have a bit of extra company. While my Tetris companion is unable to join me in a round of multiplayer, he nevertheless has this uncanny knack of improving the way I play. 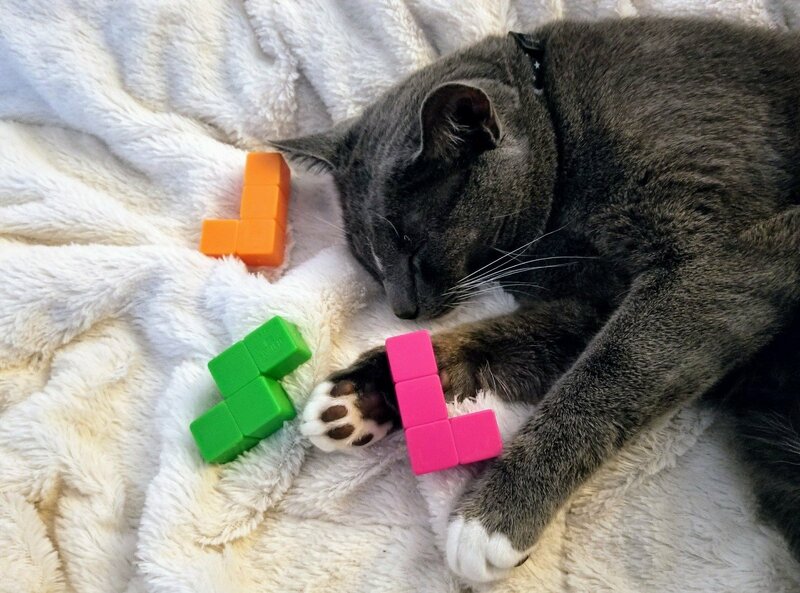 Some may be embarrassed to admit that their closest Tetris companion is a cat, but for me it’s the most natural thing in the world. Growing up, I always owned cats. Even though I loved all animals (and still do), I found it easier to relate to cats because they were shy and reclusive like me. A few years ago I moved from the west coast all the way to the east coast. It was a huge transition. After settling in, I was uncertain what the pet policies were in my new home. Could I own a pet? For quite some time, I went back and forth trying to come up with the best way to ask my landlady. Finally, I broached the subject and after being given permission, went out in search of a cat. 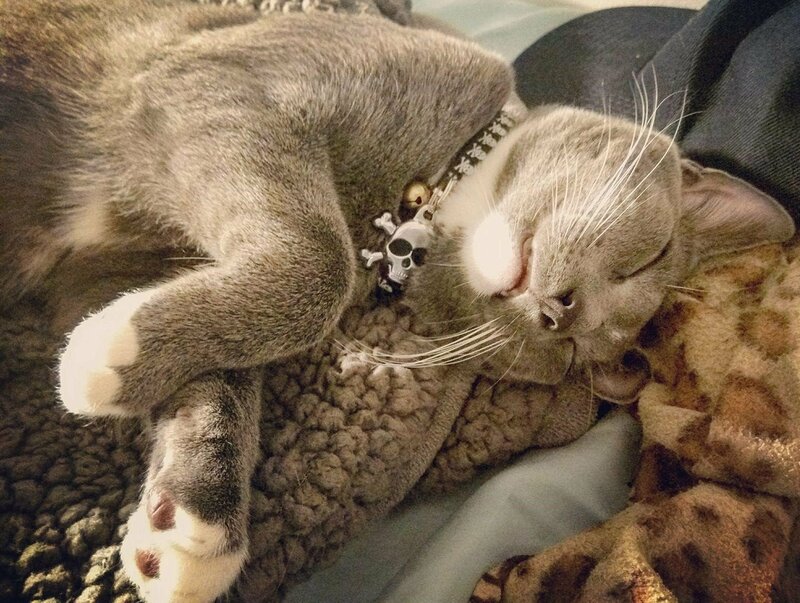 Sometimes things are just meant to be, as Saitama (Tama for short) was the first and last cat I met at the shelter. We connected instantly, and he even wound up falling asleep on my lap. Upon taking him home, I noticed he had a few notable quirks as all animals do. One, he had a fierce love of soft blankets and would go out of his way to curl up in them. Two, if I was sitting down somewhere, he’d make it a priority to be as close to me as possible. This is how he grew to become my Tetris companion. It doesn’t matter what time of day I decide to play or where. Tama will always seek me out. For example, he loves to sleep on my lap when I play Tetris on the computer. Sometimes he’ll even perch beside me and watch me play! When I play Puyo Puyo Tetris on the Nintendo Switch, I bring a blanket and get comfortable on the couch. Sure enough, if no one is sitting beside me, I hear his collar bell jingling as he rushes to curl up beside me. It’s always funny to see him watching the TV with his head rested on his paws. It has become this unspoken routine between the two of us. I find that when he’s nearby, I can pet him if a match ends badly or I feel stressed. In doing so, my game improves significantly. I always play my best Tetris games when I’m calm, cool, and collected. Tama’s relaxed vibe seems to rub off on me somehow. Now, I can’t imagine playing Tetris without him. It makes me wonder how many other Tetris players out there have their own unique Tetris companion. Do you have a dog who curls up beside you while playing Tetris? What about a bird, rabbit, or ferret? Be sure to share your pics, and your stories, about your furry Tetris companions with us on Facebook, Twitter, and Instagram. I’m sure there are way more Tetris fans within the animal kingdom than most people realize! Or, if you just need to get a few rounds of Tetris out of your system, you can click here to play Tetris for free right here at Tetris.com!